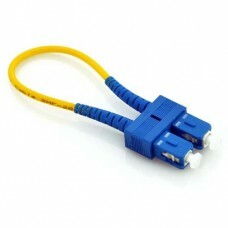 Fiber Optic Loopback is designed to provide a media of return patch for a fiber optic signal. Typically it is used for fiber optic testing applications or network restorations. For the testing applications, the loopback signal is used for diagnosing a problem. Sending a loopback test to network equipment, one at a time, is a technique for isolating problems. Similar as fiber optic patch cords, fiber loopback can be with various jacket types and cable diameters, and they can be with different terminations and length. We make fiber optic loopbacks strictly according to industry standard. Each of the loopback is functionally tested before shipping. And we offer custom assemblies for fiber optic loopbacks such as custom connector configurations and special polishing. Fiber optic loopbacks are with compact design, and they are compliant with fast ethernet, fiber channel, ATM and Gigabit ethernet. we also offer custom assemblies for fiber optic loopback. the common fiber optic loopbacks types are: SC fiber optic loopback, FC fiber optic loopback, LC fiber optic loopback and MTRJ fiber optic loopback.